If you still create product relations manually, then we recommend you to pay attention to the following extension lists: Related Products Magento 2 Extensions and Related Products Magento Modules. The tools described there will essentially improve your daily routine helping you save lots of time and effort. 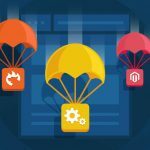 But what should you do if there are tons of related products, cross-sells, and up-sells on your ecommerce website, but you want to move to another store? 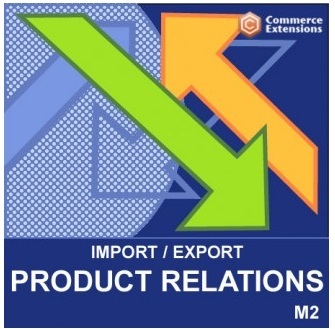 The answer is quite simple: use the Commerce Extensions Import Export Product Relations module. With the help of this extensions, you will save all your painstaking work, since it is designed to import/export related products, cross-sells, and up-sells. Furthermore, it even lets you set product positions. Sounds intriguing, so let’s explore it in a more precise manner. First of all, it offers the import/export functionality for related, up-sell, and cross-sell products. Next, you can move product positions for the aforementioned products between websites. The extension allows you to replace the existing product relations or add new ones to them. 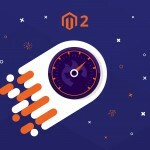 Nothing is said about migration from Magento 1 or third-party platforms to Magento 2, but it seems that you can leverage this functionality as in case of other import/export modules by Commerce Extensions. It bears reminding that solutions described previously offer this functionality. 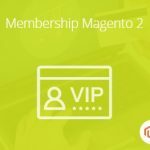 You only have to get a CSV file with the corresponding data and import it into Magento 2 via the appropriate extension. The description of its settings and values is available in the official extension’s manual. As for the module’s backend, it is user-friendly and intuitive. 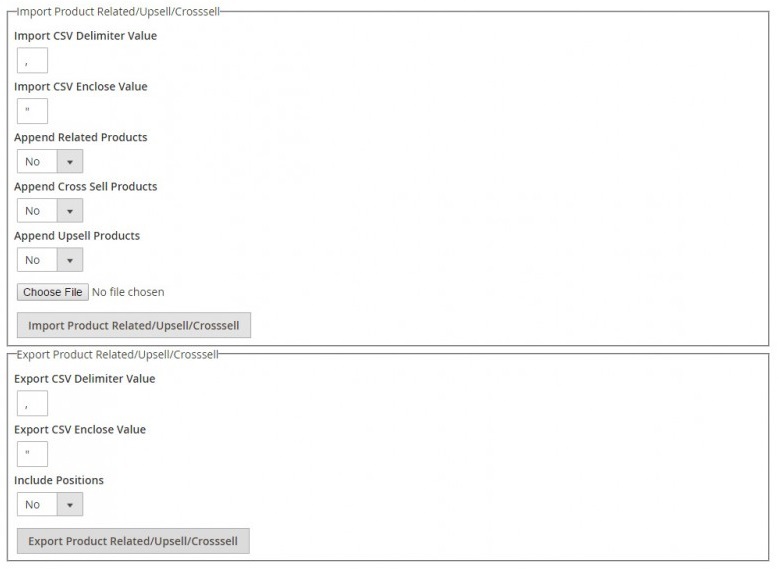 Under System -> Import/Export Product Related/Upsell/Crosssell you can find an interface divided into 2 sections. The first one is related to import, while the second one is designed to provide export features. In both cases, you choose delimiter and enclose values. The export section includes one more option – Include Positions. It is designed to export relations data with information on product positions. As for the Import section, we’ve already mentioned that it includes three “Append” options that allow you to decide whether to replace the existing relations with the new ones or mix them together. The functionality can be configured for Related products, Cross-sells, and Up-sells individually. The Commerce Extensions Import Export Product Relations Magento 2 module is designed to improve your migration between Magento websites. If you age going to change the store but don’t want to lose tons of work on product relations, the module will become your favourite migration tool. And it costs just 50 bucks!